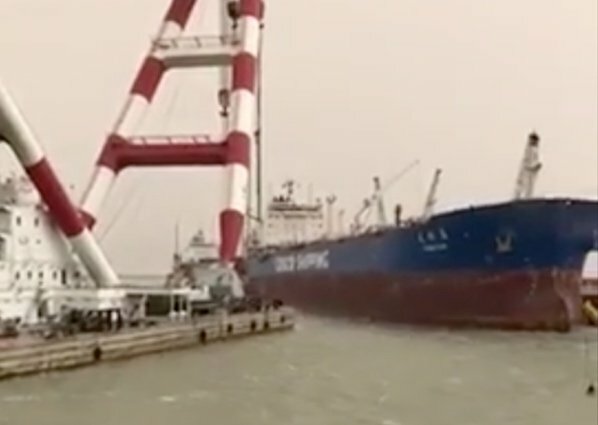 China Cosco Shipping’s product tanker Tian E Zuo was involved in a collision with a floating crane at Khor al Zubayr port, Iraq on Friday. A video showed that the tanker was anchored while it was hit by the floating crane. Following the collision, the tanker suffered a hull breach and ballast water was seen leaking from the vessel. The tanker has headed to Dubai for repairs and according to latest AIS tracking information is now anchored near Dubai. The 2012-built Tian E Zuo is currently on a one-year time charter contract with Russian energy firm Lukoil.